This page is a browsable version of the Kymera Wand manual. Click on one of the flags below to download a PDF of the original Kymera Wand manual in your chosen language. The Kymera Wand is a buttonless remote control that can learn up to 13 infrared (IR) codes from existing remote controls and replay those IR codes when the user makes one of 13 predefined movement “gestures”. Any button from a remote control can be assigned to each of the 13 gestures – there is no need for all the codes to be learned from a single remote control. This product is not a toy; it is an instrument of control. In order to use it properly and become an expert wizard or witch, you will have to practise using it. Once you are the wand’s master, you will need to teach it to control things in your home. Only then will you be ready to perform your magic. The Kymera Wand is supplied with two AAA (LR03) batteries. Before first use, open the battery door by unscrewing the silver dome on the end of the handle and remove the small white plastic isolation tab. Discard the tab carefully in the rubbish. Replace the battery door. The Kymera Wand has no on or off switch; it is always ready to be used. Whenever you leave the wand motionless for one minute it falls asleep. Picking up the wand, or moving it, wakes it up and it vibrates with three double-pulse heartbeats to tell you that it has woken up and is ready to be used. The batteries should last for three to six months, depending on usage. When the batteries are low, the wand tells you that they need replacing by doing three fast pulses after each gesture. When replacing the batteries it is important that you use only good quality alkaline batteries – do not use rechargeable batteries as their voltage (1.2V) is not enough for the Kymera Wand to function properly. Never mix old and new batteries as the difference between them can cause heat to build up in the batteries and can be very dangerous. Batteries should be inserted with the positive pip terminal facing out towards you as you drop them into the Kymera Wand handle. Always remove the batteries if you are going to leave the Kymera Wand unused for more than a few months. The Kymera Wand doesn’t have any lights and doesn’t make any beeping sounds, instead it communicates with you by a series of gentle vibrational pulses in the hand. 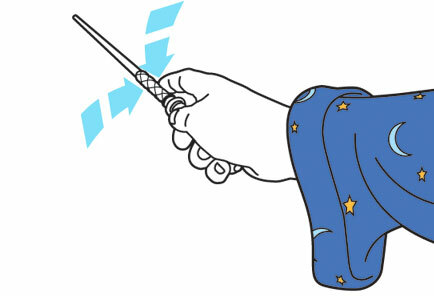 As you move the wand, you will be able to feel the handle pulsing gently. When you use the wand for the first time (before any remote control codes have been programmed on to it) each time you correctly do one of the 13 recognised gestures, the wand will pulse a certain number of times depending on which gesture it thinks you have done. This is Practise Mode. The wand remains in Practise Mode for any gesture that has no remote control codes programmed on to it, (see below for how many pulses relate to each gesture). Once you have programmed a remote control code on to a gesture, that gesture is no longer in Practise Mode it is in Control Mode. After programming a code on to a gesture, then in future, when that gesture is done correctly, the wand will playback the programmed remote control code and will only pulse once. Practising before you program the wand with remote control codes is important. The gestures will take a few minutes to master, but once you know how to do the gestures, you will find that they are very repeatable and easy to do. The key to becoming an expert at the gestures is to always remember that the Kymera Wand is a sensitive motion activated device, designed to recognise 13 distinct and accurately performed gestures. The gestures do not need to be forceful or dramatic, just positive and accurate. The wand’s motion sensor is looking for a clear start and stop to each gesture, so always start a gesture holding the Kymera Wand level and steady. 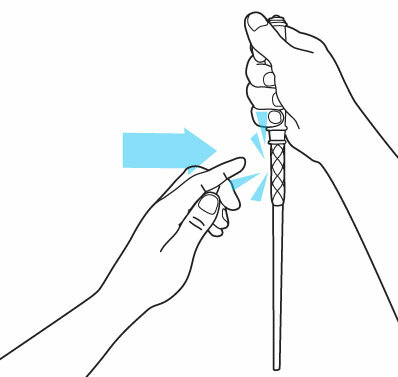 Remember, that except for the Big Swish gesture, only a short, positive action is required for each gesture; the tip of the wand only needs to move about 5 -10 cm (two to four inches), which is usually much less than you think. Repeat each gesture until you can do them easily and repeatably. The rotation gestures must be performed slowly, holding the wand steady and level, rolling it between thumb and forefinger as if gently turning a volume knob. The Kymera Wand has 13 gestures and a single remote control code from almost any infra red remote control device can be programmed onto each gesture. The gestures are: rotate anticlockwise, rotate clockwise, flick up, flick down, flick left, flick right, tap on the top, tap on the side, big swish, push forward, double double tap on the top, double tap on the side, and pull back. To do the rotate gestures (clockwise or anticlockwise), hold the Kymera Wand steady and level between thumb and forefinger and roll the wand very slowly as if turning a volume knob. Be careful not to roll it too quickly and remember to keep the tip steady and level. To start the rotation gesture, the wand is looking for a clean steady quarter turn so rotate the wand very slowly and smoothly one quarter-turn, keeping the tip steady. Once you’ve gone just over a quarter-turn, the wand will register the rotation and go into fine-resolution rotation mode, where it will register an event every 15º – this allows you fine control with only small movements of your wrist. As you become more expert, you will find that the rotation gesture is easy and repeatable. The rotation gestures are ideal for volume control. To do the flick gestures (left, right, up and down), hold the Kymera Wand steady and level and flick it sharply in the desired direction, moving the tip no more than about 5 cm to 10 cm (2″ – 4″). Be careful not to start your flick by flicking it the opposite way first. Make sure that the flick is neat straight and clean. The gestures do not need to be big or particularly forceful, the wand is looking for a clear start and stop to the gesture. As you become more expert, you will find that very subtle gestures are possible and a very short discreet flick is all that is needed to get the wand to do what you want it to. The flick gestures are ideal for music skip forward – skip back, channel up – channel down and general menu navigation. Tapping lets you practise extra magical commands, but it is not for the novice. Once you are expert at the six introductory gestures you can begin to master the tapping gestures. Grip the wand lightly in the hand and smartly tap on the top of the criss-cross area with your index finger. You may have to start by using your other hand to do the tap. 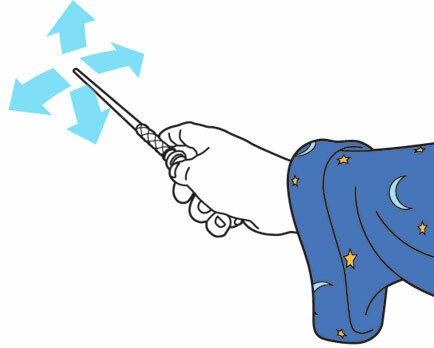 To tap on the side of the wand, without changing your grip rotate your hand and the wand a quarter turn, then pause briefly and tap with your index finger on the side of the criss-cross area. Once you have got the hang of the single tap, you are ready to try the double tap – it’s exactly the same only you tap twice on the wand, just like double clicking a mouse. 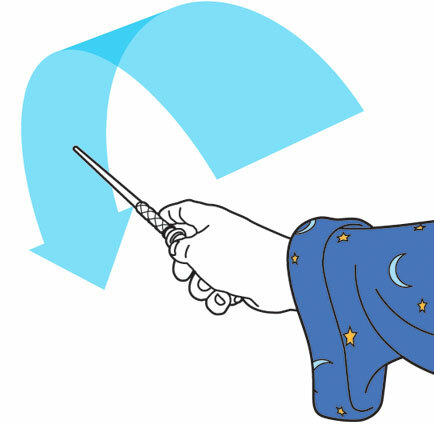 tap on the side gestures may be done on either side of the wand. The directions of the tap gestures are independent of the rotation of the wand. Each time the wand is rotated it recalibrate its idea of up, so that up is always up in the real world regardless of which way up the wand is. 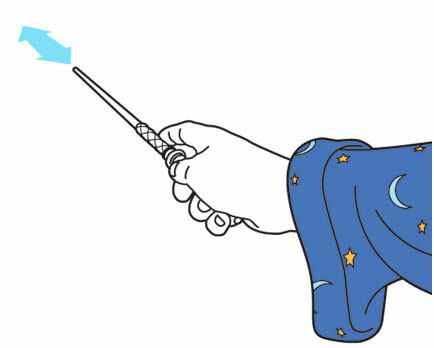 This means that “tap-on-the-top” is always a tap on the side of the wand facing upwards regardless of the rotation of the wand. 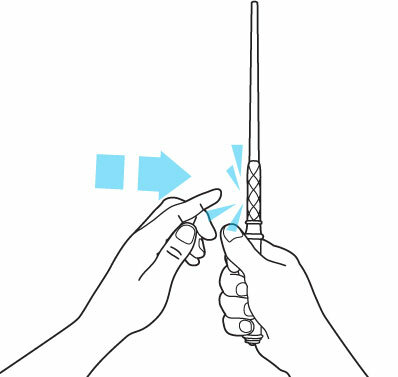 As a result, you can rotate the wand in your hand to make it easier to do the “tap-on-the-side” or “double tap-on-the-side” gestures with the forefinger of the hand holding the wand without straining your hand. The tap gestures are ideal for making menu selections. The big swish gesture requires a bit of practice to get right, but when you do, it makes for a very impressive and theatrical flourishing action. To do the Big Swish, start with the wand in the vertical position and sweep it quickly and strongly down to the horizontal position, pointing where you want to send the command. the motion sensor is looking for a hash start and stop. Some people find swishing in a “J” shape easier and more repeatable to do. The big swish gesture is ideal for turning devices on or off dramatically. If you have an infra red remote controlled light fitting or light switch, then the big swish gesture would be perfect for operating that. To do the push forward gesture or the pull back gesture, hold the Kymera Wand steady and level and jab it quickly forward or pull it back quickly, moving it no more than about 10 cm (4″). Be careful not to rotate or accidentally flick the wand as you do these gestures. The gestures do not need to be big or particularly forceful, the wand is looking for a clear start and stop to the gesture. As you become more expert, you will find that very subtle gestures are possible. Push pull gestures are ideal for turning devices on, pause – play, selecting or opening and closing a DVD or Blu-ray disc drawer. Once you have practised at the gestures and are confident that you can repeatedly do each one, you are ready to move on to programming your wand. Before the wand can be used to control your things in the home, it will need to be programmed with the infrared (IR) remote control button codes of those devices. The wand has 13 different motion gestures or actions, and can store one remote control code per gesture, therefore a total of 13 remote control codes to be stored in total. Hold the wand steadily, pointing upwards in one hand and double tap smartly on the criss-cross area with the index finger of your other hand. It will do four fast heartbeats to tell you that it is in entering learning mode. Slowly turn the wand so that it is horizontal and pointing towards the standard remote control you want to learn from and with the wand, do the gesture on to which you would like to learn the remote control function. The wand will pulse the number of times for that gesture and then start very rapid pulsing. While the wand is pulsing rapidly, point the standard remote control at the tip of the wand and press and quickly release the key on the standard remote control for the function you wish to teach your wand. Your wand will confirm it has understood and learned the code with a big pulse about half a second after you have taught it the code. If it doesn’t do a big pulse, wait for the fast pulsing to stop after a few seconds, and then repeat the gesture and the code teaching steps. You do not need to exit Programming Mode after you have programmed the wand with a single remote control code, you can continue programming your wand and program another remote control code on to another gesture by repeating the process described above. You can also reprogram any gesture with a different code if you want. Slowly turn the wand so that it is pointing straight down and tap once on its side. The wand will pulse rapidly four times to confirm it has come out of learning mode. 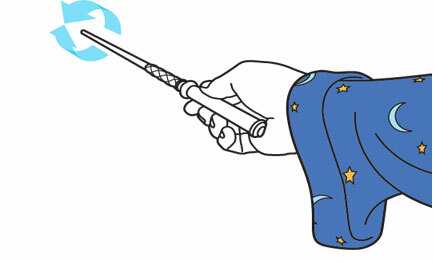 The wand will exit Programming Mode automatically after 30 seconds of inactivity. Try varying the duration of the original remote control button press from very brief up to about half a second. – Try varying the distance from the tip of the wand to the original remote control from 1 cm up to 5 cm. – Try replacing the batteries in the original remote control as sometimes the original remote control might have just enough power to function as a remote control but not enough power to beam the code into the wand. – Use new alkaline batteries in the Kymera Wand. Kymera Wand is a sensitive instrument of control and should be handled with care. Clean only with a soft, slightly damp cloth; do not immerse in water. To protect the wand while not in use, keep it safely in its silk-lined box. Do not bend the wand or subject it to unreasonably high levels of stress by sitting on it for example. Do not jab the wand at anyone as you could hurt them by accident.